Me is a delightful little book which has in the past been a part of the Bookstart pack. It’s more of one for parents to read really I think, and maybe in a way more designed for parents but it is beautiful, and the kids enjoy the penguins. The book follows a young penguin looking at the world and seeing just how big it is, and maybe just a little bit scary. Then penguin looks at Mummy/Daddy and knows that everything is safe. I’m a little late for Armchair BEA this year since I’ve been away over the weekend but I don’t think it’s too late to start! Yesterday was introductions day and I thought it’s probably a pretty important thing to start off with so without further ado…. My name’s Lucy, I’m 25 and I live in Birmingham, UK. I’ve had this blog for almost 3 years now although it’s only been in the last couple that I’ve really gotten into the blogging community. I started off with a review post on The Bookclub Forum but I waanted to expand it to include general musings and news about books so I started this blog, I’ve not looked back since..
2. What are you currently reading, or what is your favourite book you have read so far in 2012? At the moment I’m reading The Good Angel of Death by Andrey Kurkov on paper, and a review copy of The Whipping Club by Deborah Henry on my kindle. I’m finding The Good Angel of Death a little difficult to get into, despite really enjoying the other Kurkov novels that I have read. I’ve only just started The Whipping Club so I’m not sure on that one yet. My older sister gave birth to my first nephew a couple of weeks ago, and I went to see him last weekend. He is absolutely gorgeous. 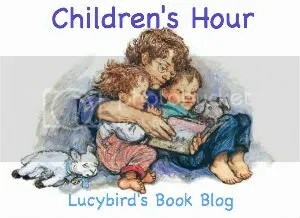 I’m quite liking my Children’s Hour feature at the moment, but generally I like writing musings, I would like to write more of hem though! Oh I really don’t know. I suppose as long as I still enjoy writing it, and people still enjoy reading it I will keep going! Oh just one? Umm personally I like my musing on series but my post about how a book’s popularity might effect your reading of it has been one of my most popular posts, and I’m quite proud of that! Hmm I think dinner with Stephen Fry would be very interesting and fun. You know what I don’t really have any. Or does the libaray from Beauty and The Beast Count? I like how people support each other. I’ve had a lot of help when I needed it on twitter, some fantastic recommendations and referrals from fellow bloggers, and sometimes just a nice chat. Not by a great deal. I read more indie authors now, mainly because that’s who I get review requests from. I probably read a few more young adult books as well, although it still takes a fantastic review to get me to read a YA novel most of the time. I’m a little late for the party but I just found out about the armchair BEA and am very excited to be participating. Seeing as I live in the UK getting to the ‘real’ Book Expo America isn’t the easiest thing for me! It’s good that I can join in without actually being there. So about me…My name’s Lucy, I live in Birmingham in the UK. I’m 24, I’m a nursery nurse and absolutely love my job. I do lots of my reading on the bus because it takes me about an hour to get to work each day and an hour to get back. My taste in books is pretty varied but I mainly read contemporary fiction. I read a fair bit of historical fiction, usually focussed around the two world wars, a little Young Adult and very occasionally some Chick Lit. I read some none fiction too, mainly psychology stuff (I have a psychology degreee and I like o keep my feet in the psychology world). My wishlist is pretty much out of control but I almost never buy books from it because I get caught up in the 3 for 2s at Waterstones. Some of my favourite books are the Harry Potter books and I pretty much credit them with my internet life, it all started off when I joined the forums over at the Bloomsbury website (which sadly no longer exist). I also love Phillip Pulman’s His Dark Materials, books by Sebastian Fawkes, The Time Traveller’s Wife, books by Jodi Picoult, Captain Correli’s Mandolin, The Historian, and books by Haruki Marukami. When I’m not reading (or working) I like shopping, listening to music, watching TV (at the moment I’m mainly watching Glee, How I met Your Mother and The Apprentice) and anime, watching films and hanging around online. My blog is mainly focussed around the book reviews. I don’t really take part in memes, just The Book Blogger Hop. I sometimes post musings as well to do with the bookworld and I post reviews of films which are based on books. I’ve just launched a new blog hop which is designed to get people looking at blogs which they wouldn’t normally look at, pop by sometime between Thursday and Sunday if you’d like to join in. 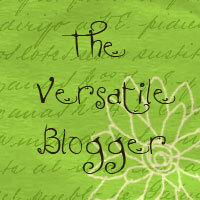 Laural-Rain Snow has given me this Versatile Blogger Award. Thank you, thank you. 1) I’ve taken part in NaNoWriMo the last 3 years. This year and last were both monumental failures but the first year I was stuck at home with a broken leg and finished before time was up. My ‘novel’ still needs some series editing though and I’m very lazy about getting it done. 2) It’s been snowing here in Birmingham over night and I find it exciting! 3) I’m a big Harry Potter fan. I am always disappointed by the films because they just don’t add up to the books but I am going to see the latest one this afternoon and am actually very excited, I think maybe because it’s something new from Harry World. 5) My body thinks I’m an old person. I wear hearing aids and very thick glasses and have osteoporosis. God knows what my body will do when I’m actually old! 7) I’m a psychology graduate. That’s why most of my non-fiction reads are psychology related. I can’t pick 15 bloggers but here goes…. Everything breaks. Some things just hurt more than others. (highlight for spoiler) I never expected it to end this way. I don’t understand why. Why did Willow have to die, and in such a way? Was it so nobody really lost the court case? Seems extreme measures. I would like to think that at least it meant that Pippa and Charlotte, and Emma and Amelia became friends again. 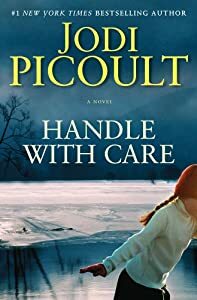 For me I think this may be my new favourite Picoult book, not because it has the best plot, or is the most well written- both those are good but maybe not her best- but because it touched me personally. It didn’t make me cry but it did bring me close a few times (and generally books don’t even do that). Sometimes because of Willow herself, sometimes because I could see myself in her, and sometimes because it brought my own memories forward. I liked how we always saw Willow through other people’s eyes. Except for the one chapter where Willow spoke. (highlight for spoiler)I liked how Willow didn’t see the money as realy being hers so much as something that had brought her family back together. She didn’t so much care about what the money gave to her as that it made her family happy. This part made me close to tears at first because everything that had happened it didn’t really matter to Willow, she just wanted her family to be happy. I also liked the recipes throughout the book, they made for something different. Other people may not like this book as much, I am not sure, but I still think everyone will enjoy it. 1. Accept the tag and link to the tagger at the beginning of your post. 2. Answer the questions honestly in your post by listing four things. 3. Pass on the love by picking four other people to tag and listing them at the bottom at your post. 4. Notify them that you tagged them. 4) I have a big box in my room full of cosmetics.